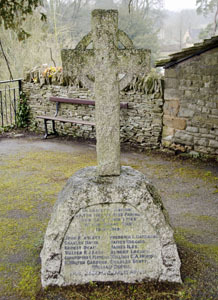 The war memorial is a small stone cross on a granite base located in the Baptist Chapel graveyard. Note: The Baptist Chapel is closing, but it is planned to leave the war memorial in the current position in the Baptist Chapel courtyard which will remain open to the public. CHRISTOPHER C. FLETCHER 10TH GLOS. FREDRICK G. HATHAWAY 1ST GLOS. WILLIAM C.A. MUNDY 10TH GLOS. WILLIAM F. TIMMS 2/7 R. WARWICKS. The grey painted cross that served as the original marker for Gunner John Bartlett's temporary grave. [Words in a scroll with Union Jack and White Ensign flags above]. 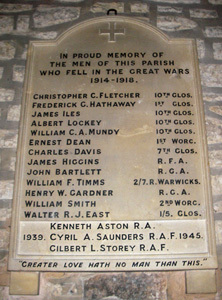 Of the men who enlisted from Naunton Parish for the Great War and returned safely. [Words in a scroll with Saint George slaying the dragon above]. OF THOSE MEN FROM THIS PARISH WHO JOINED H.M. FORCES IN THE SECOND WORLD WAR AND RETURNED SAFELY. Gunr J. Bartlett, 274 RGA, 110951, interred in France. There are the discrepancies between the two war memorials regarding the names listed.